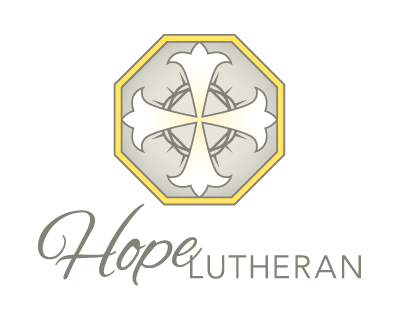 Hope is a word that is so commonplace that we easily forget what it means in the Christian context. “I hope we get rain soon.” “I hope I can get off work on Friday.” “I hope the Bears make the playoffs this year.” In Peter’s first epistle, he writes, “Praise be to the God and Father of our Lord Jesus Christ! In his great mercy he has given us new birth into a living hope through the resurrection of Jesus Christ from the dead, and into an inheritance that can never perish, spoil or fade. This inheritance is kept in heaven for you” (1 Pet. 1:3,4). This hope that we have is not the wishful thinking that we indulge in every day. It is a 100% certainty made possible by the death and resurrection of Jesus Christ. At the center of the logo, you see the crown of thorns. A prize worth having is not a prize easily won. Jesus suffered the wrath that our sins deserved on the cross, and carried it to the grave. We also must bear our crosses and thorns while we live on earth—Jesus promised this. But in front of the thorns you see that the cross made of lilies, because for Jesus, and for us, death is not the end. His resurrection is also our resurrection. The tips of the lilies touch an eight-sided ring made of gold. In the Christian church of centuries past, the octagon had special significance for the believer. In the Bible, seven is an important number of completion—there were seven days of creation, and seven days in each week. But Jesus rose from the dead the day after the Sabbath—the eighth day. For us, the eighth day represents a new birth. Therefore, baptistries and fonts were often made with eight sides, to remind believers that we are baptized into Christ’s resurrection. We are new creations, waiting only for new, glorified bodies and the New Jerusalem. God help us to live as his redeemed creations, until the day when we will rejoice forever with Jesus in heaven. This is our hope—and what a certain hope it is!